Optical illusions are pretty popular with…well, just about anyone. I know our regular followers love optical illusions, obviously. But, sometimes I wonder just how much you guys really love optical illusions. Do you have optical illusion art on your walls? Would you consider getting an optical illusion tattoo? 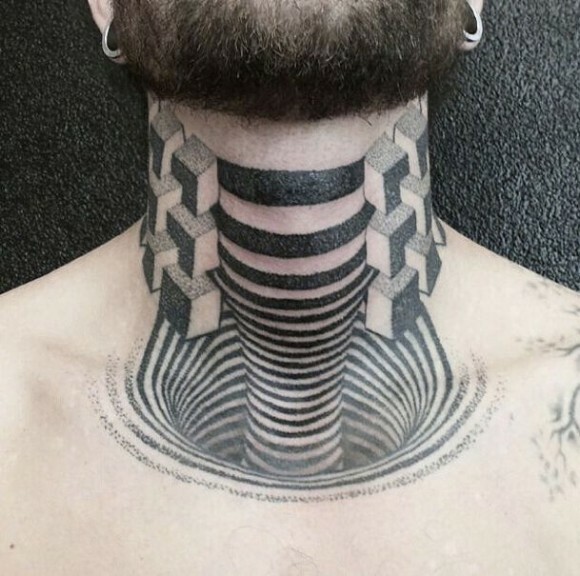 What about this illusion throat tattoo? This is one of the best optical illusion tattoos I’ve seen thus far! The design makes it appear as though there’s a cavern sinking into this guy’s chest from his throat. Super creepy, and totally awesome and pretty amazing really! I think I would definitely consider getting an optical illusion tattoo. But, on the throat? Absolutely not! I have a thing about my throat and can’t even stand it being touched. Braving a tattoo needle anywhere near my throat is pretty much out of the question. Wanna see another optical illusion tattoo? Check out this awesome arm tattoo illusion and this crazy alien tattoo!